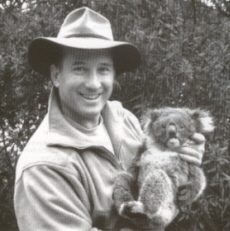 While studying the Diploma of Natural Resource Management at the Ballarat School of Mines (SMB) in 1996 Andrew Vassilou and Scott Buckingham went on a field trip to Mt Eccles involving the translocation of koalas. Enthused by the work the pair established an environmental land management business called 'Koala Search' while they finished their studies. They decided that a safer and more efficient way of transporting koalas was required, and the resulting invention was the 'Vassac'. The 'Vassac' is a pouch that provides a safe, dark environment in which to transport koalas. Once in the 'Vassac' the koalas become calmer, sleepy and easier to handle. The Vassac is hung on a special rack on the back of a utility where they gently swing to and fro as they travel. The invention resulted in a State Training Board Achievement Award in 1997. The Vassac in now used Australia wide for the transport of marsupials over short distances, resulting in a less than 1% death rate due to transport stress. Andrew Vassilou also won the 1996 SMB Award for Excellence and was nominated for the 1997 the E.J.T. Tippett Outstanding Achievement Award for Excellence at SMB. Andrew Vassilou graduated with a Diploma of Education (Secondary) from the University of Ballarat in 2004, and a Bachelor of Biological Science from Deakin University. He was employed by the University of Ballarat and works at the SMB Campus. In 2008 Andrew Vassilou was course co-ordinator of the Conservation Land Management course. 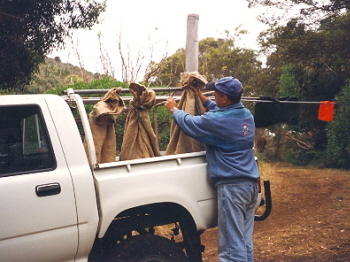 Image caption (LHS): Andrew Vassilou loads koalas onto a ute using the 'Vassac'.